Starting in Pago Pago we noticed that the PVC part of the dinghy was coming loose from the fiberglass. We had a small tube of PVC glue and tried for a patch. It didn't work. When we got to Vuda Point we put the dinghy on the ground. 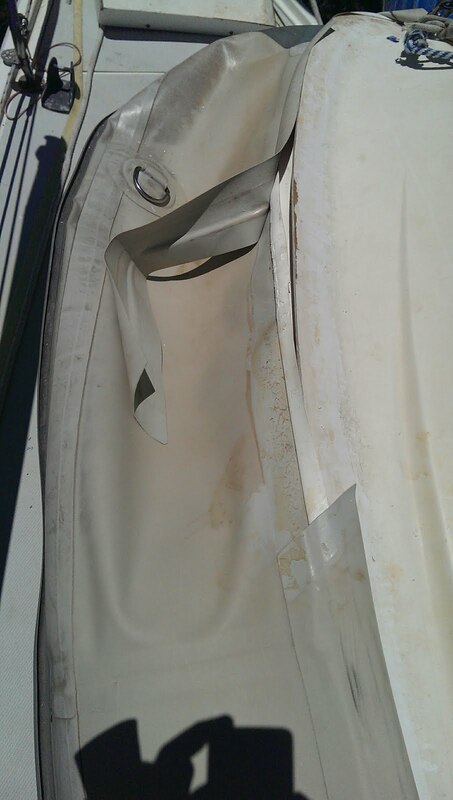 Almost the entire seal between the PVC and the fiberglass was gone. 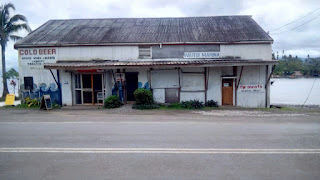 Fortunately the local chandeliers had PVC glue, something we had been unable to find in American Samoa, Tonga and Savusavu. 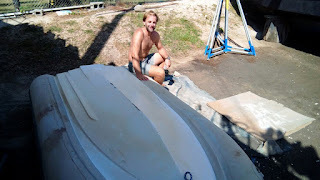 After many hours - most by Matt - of cleaning and scraping the old glue and dirt off today we reglued the entire dinghy. Thanks to Matt it is looking 100% better. Those who follow know that most of the time we were in Tonga and American Samoa we were plagued with rain. 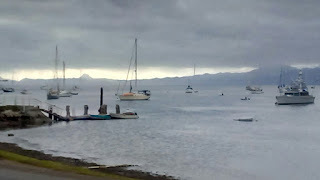 We even frequently had morning showers in Savusavu. Since we arrived in Vuda point it has been very hot and sunny. What goes around comes around. Tonight we can hear thunder. Since Reboot is on the hard and we have expert mechanical help I decided to have the cooling system cleaned. It was a little more involved than I expected. 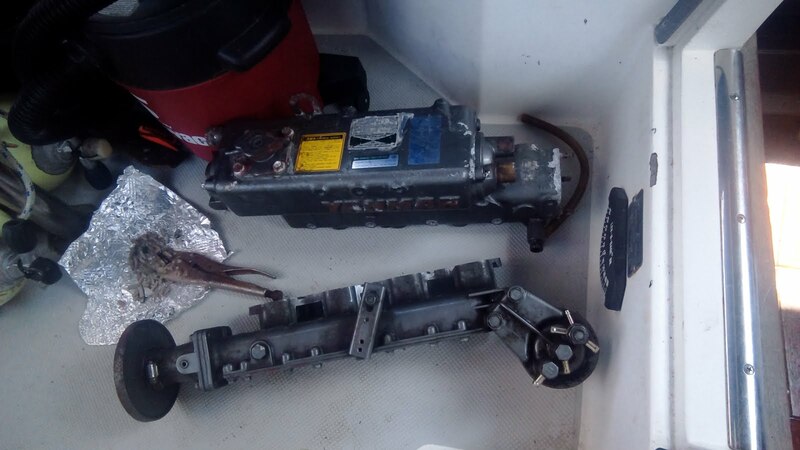 Here are the intercoolers back from being cleaned and ready for installation. The engine is buttoned back up. We are still waiting for the new shaft. Today was rudder day. In order to insert the new shaft we have to drop the rudder. Matt and I spent a couple of hours disconnecting everything. 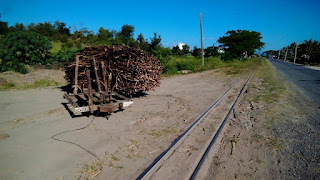 Running past Vuda Point Marina is a narrow gauge railroad. 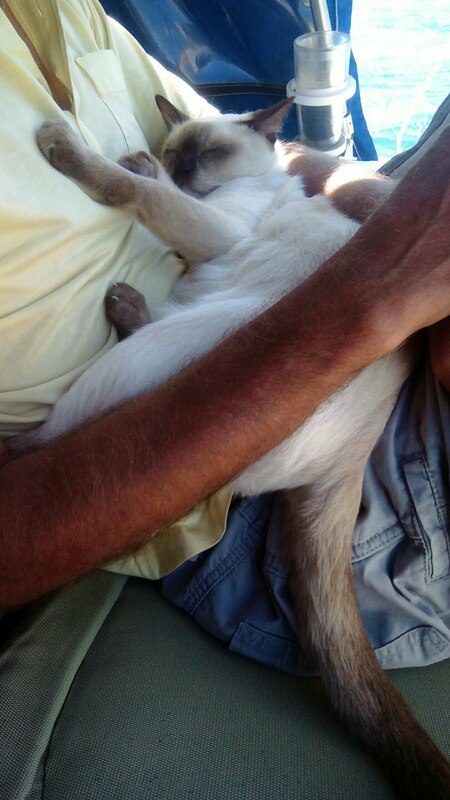 I thought it was abandoned but it is very much in use. It is the (sugar) cane trait. In the days of sail there was a time set aside for the sailors to mend their clothing, relax and chat. Sailors also made their own clothing. This was a opportunity to deal with their personal needs. On Reboot it is also a time to go over all the sheets and halyards to check for chafe. Today was a rope yarn day. After what seems to be a month of overcast weather we are now blessed with sunshine. The downside is that it is so hot at midday that it is difficult to get work done (as in we don't feel like working in the hot sun.) Since it is almost spring the days are getting longer so we concentrate our work in early morning and late afternoon. 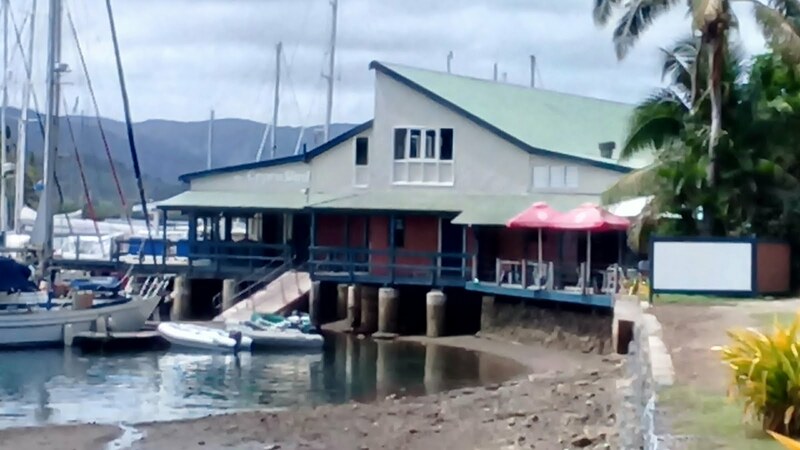 Vuda Point is the first comprehensive marine repair facility when traveling west from Tahiti. entrance channel is well marked with white poles. At night they are illuminated by flashing red and green lights. Night entry is still not recommended. The marina facility is "med morning." A chase boat is required to help you into your slip. Be prepared to wait outside for your turn. As of this writing the marina monitors channel 11. Approaching the entrance channel is straightforward the second time. The first time not such. The marina is not shown on the (Garmin) charts. The area around the entrance is littered with buoys (most not on the charts) and an offshore pipeline for tankers. As you get closer the picture becomes clearer as you sort out the channel, pipeline, quarantine, anchorage, etc. buoys. The quarantine buoy is large, yellow and round. Do not confuse it with the yellow "can" buoys. It has "marina" painted on it. It is to one's left as you approach the channel. The marina megayacht facility is still an artist's conception although some work has been done on the breakwall. The interior basis (at the moment the only one until the megayacht facility is complete) suffers from poor water flow so the water is quite dirty. Don't expect to dive to check the bottom of your boat. The staff is very helpful and efficient. There is a list of contractors and the availability of casual labor to help with washing, etc. The restaurant is nice but more pricey then in savusavu. We spent the day sailing inside the reef. We still had very variable winds but the reef kept the waves down to a maximum of 4 feet. Most of the time they were 2 feet or less. We are sitting at anchor for the night. There is a gentle breeze and the waves are gently lapping against Reboot. Wow. Of course yesterday XO was vocally complaining all day as we rocked and rolled. But today - paradise. 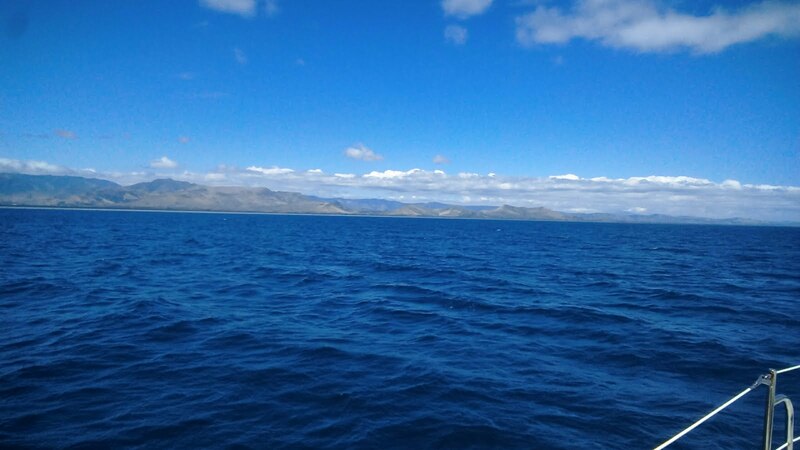 After several days of high winds and high seas we are sailing downwind in sunny weather and moderate winds we are finally having a nice sail. After several days of hiding from the wind and waves yesterday we decided that the wing had moderated enough to transit to Nanu inlet. We left in winds in the low 20's and worked our way around the island. Waves were in the 4 foot range. We had set the third reef in the main and put out about 50% jib. This gave us the ability to point about 15 degrees higher. That would become important later as we had to tack our way around several reefs. Once we cleared the immediate reefs we aimed at Nanu. It was only about 23 nm and we were making 5.5 to 6.5 knots. Although uncomfortable from the 28 to 30 knot winds in the cockpit (since we were heading upwind the apparent wind was the true wind speed plus 80% of the boat speed) and the frequent boarding waves making us all wet the miles went quickly. 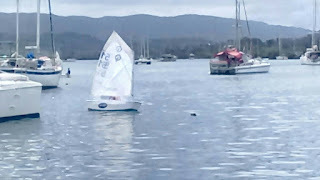 From our sheeting angle it looked like we could sail direct. Except for the set from the waves. By the time we reached Nanu we were 4 nm off course. We had to tack to get back east. This put us back into the heavy wind, waves, and set. By the time we got into the inlet several more hours had passed. In the end we sailed 54 nm at an average speed of 5.2 knots to make 29 miles good. We made it into the inlet during sunset. 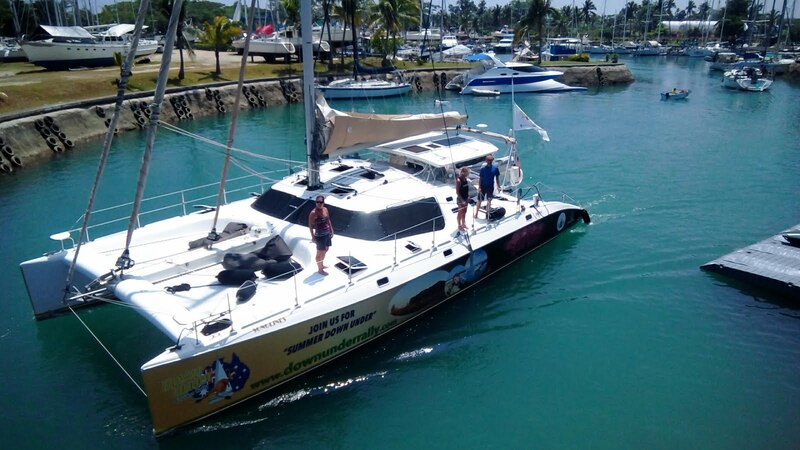 The next few days we will be sailing down wind to Lautoka. Al will be leaving us. We may pick up an additional crew. We are still hiding out behind Yavua, Fiji waiting for the weather to clear. This morning we got rain. This is usually the sign that the weather will change. Fat chance. Apparently we have another night and then we might get a window to depart. Today the weather has been even weirder. The wind started to drop into the low teens. It has not been below 20 knots for three days. Then bam- a 33 knot gust followed by stained winds in the mid 20's. The seas are also strange. We are behind the island so we get some protection. They still vary from periods of 2 foot waves to periods of 4 to 5. Sometimes on the nose (aligned with the wind, we are at anchor.) Sometimes on the beam. We had another rule 6 incident today. The marine mf/hf (ssb) radio stopped working a couple of days ago. Today it started working again for no apparent reason. We checked into the Pacific Seafarers Net so they know we are out here. We have been sitting at anchor waiting for the wind to die down. We are somewhat sheltered from the waves. This is a good thing as the wind has been peaking over 30 knots. That type of wind normally generates 10 ft or higher waves. Behind the island they are peaking at 4 feet. Not super uncomfortable but not great either. Since our next destination is upwind it would be a very ugly sail should we have set out this morning. Matt and I are sitting in the cockpit watching the sunset. We are in the middle of a frontal passage so it is quite pretty. The wind keeps tricking us. Just as we think it is going to moderate we get blasted with a strong set of gusts. We have had four visits from local Fijian fishermen today checking to make sure we are ok. It is a very nice feeling. The anchor has been holding and there really isn't anyplace to go. If we go into their small harbor we will be stuck and need to get towed back out. So this is not great but we are doing ok. Nice to know they are watching out for us. 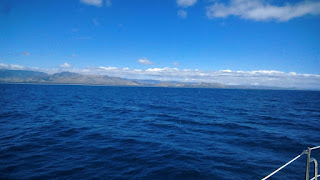 We left Savusavu yesterday morning on the way to Taveuni. That is, until we snagged a semi-submerged bottle and rope. This gave us great pause. We dropped the anchor (in the middle of the mooring field.) 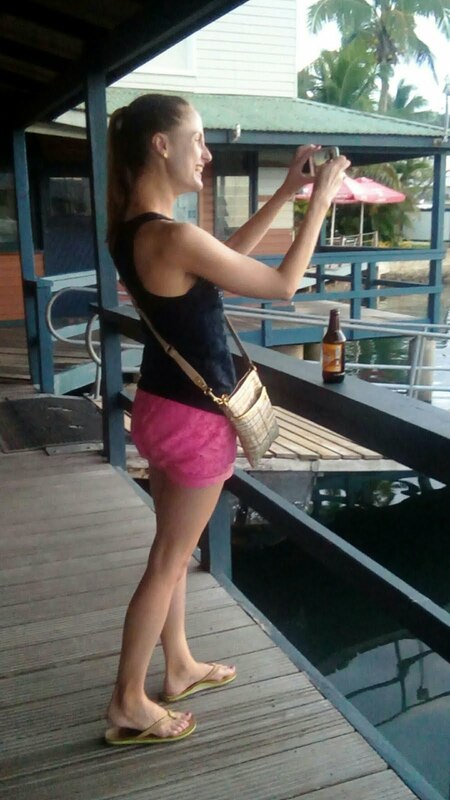 The next step was to avoid hitting any of the moored boats. At least not hard! We ended up next to Doug on Mango. A few lines and a few fenders and we were safe. 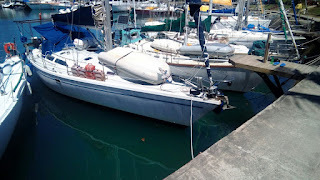 Of course our anchor chain was wrapped around Mango's mooring line. Using the stern steps on Mango Al dove down and cleared the line. We motored out of the harbor only to pick up a lot of engine vibration. Since there are no repair facilitates in Savusavu we decided to skip Taveuni and head for Nadi where there are travel lifts etc. 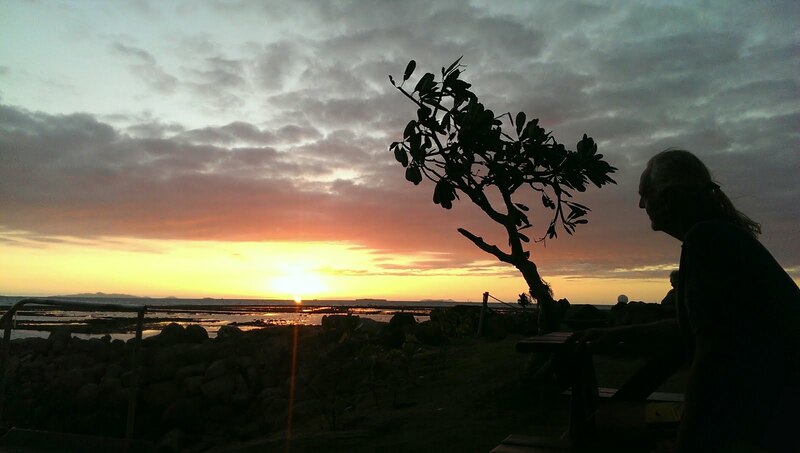 For some beautiful pictures of Tavunei see Elizabeth's blog at http://etheislandenthusiast.com. We will miss standing on the 180th meridian. Watching the boats heading east as they rammed into the 5 foot waves, motors churning maybe we didn't miss so much. But you ask: "Why the land of 1,000 hazards?" The answer. You can not go from here to there. There are always islands, shallows, and reefs in the way. One has to thread their way through them following the approved path because the other routes end in dead ends. So we did until sunset. At which point we noticed some sailboats and a harbor to our right. We turned but could not point high enough to make it to shelter behind the point. We spent a very uncomfortable night at anchor in 23 knot winds and 4 foot waves. Getting back out in the morning (no, the winds and waves did not drop) was a story of its own. I did dive on Reboot but did not see any obvious problem. There is a lot of marine growth on the shaft but nothing wrapped around it. Since Reboot was bouncing around in the waves I did not investigate further (rule 1). We are now threading our way along the route to Nadi. 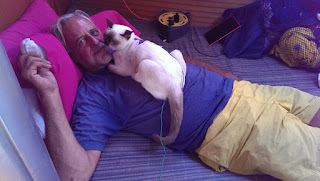 My previous poet got me thinking about the great secret of the cruising life - it is hard work. Yes, staying up all night standing watch, cranking on winches to adjust the sails, grabbing handfuls of sail cloth to coax the main down in a strong wind, these all take physical strength. Add manhanding the ground tackle (anchor and rode) and dealing with dock lines. But they don't tell the real story. Consider the three modes of being in port: marina, mooring buoy, or at anchor. For two of the three everything - and I mean everything - has to be brought out to the boat by dinghy. 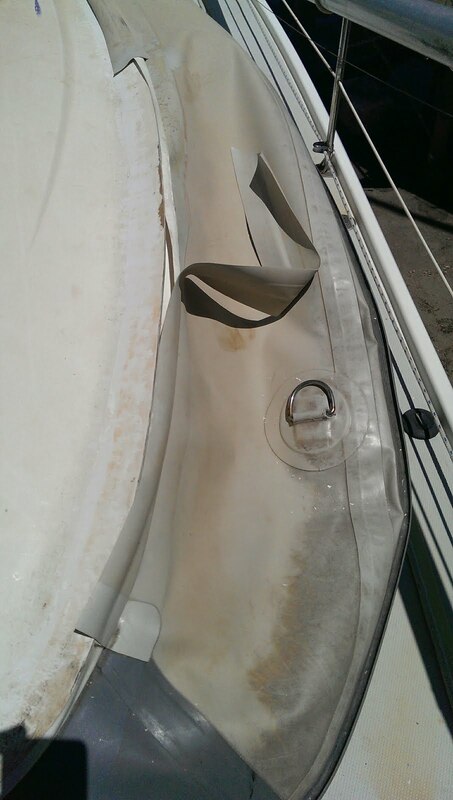 And how did the food, water, clean laundry, propane, repair parts, repaired sails, etc. get to the dinghy? Why one lugs them across town to the dinghy dock. Usually for quite a distance. Sure, for a big provisioning run you might hire a cab to take your stuff back. In some ports the grocery store might even deliver. But most days we all (cruisers) buy a couple of shopping bags of "stuff" and lug it back. Even in a marina you still need to get stuff from the marina parking lot to the boat. Assuming you have not already lugged it back from the store. Now most marinas have carts but then you have to load the cart, drag the stuff out to the boat, and then return the cart. I should also mention that like camping rain, bugs, and so forth are a pain in the neck. Oh well. 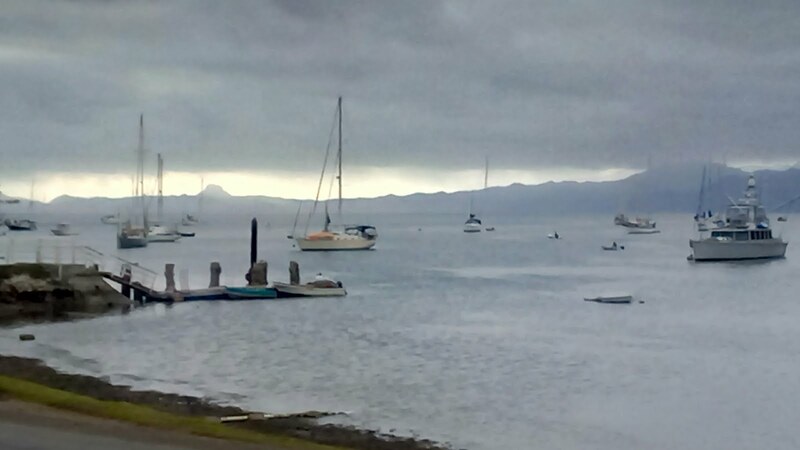 We intended to leave Savusavu this morning and head out to explore more of Fiji. The rain quelled our ardour. So I came into shore to pay the marina for one more night on the mooring ball. I also figured I could get a hot shower. That got me thinking. If you had every told me during my executive days that in my retirement I would be sharing the "mens' locker room" to take a shower or use the bathroom I would have laughed. But the thing is, I do. Sure I use the head when on Reboot. But marine heads are notorious for clogs. So the less use the better. (We have a rule on Reboot: any woman who flushes a "feminine napkin" down the toilet pays a $200 fine for a new pump and gets to unclog the system! They are brutal on the waste system no matter what the package says.) Showers are another thing. It takes the water maker 4 hours to make five gallons of water. Then you have to run the engine to heat the water up. It is a great disincentive. Ok. Could have taken a picture of the sunset. 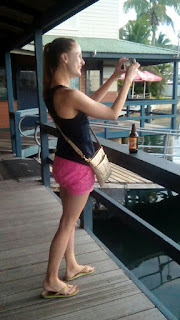 I preferred the pretty girl taking a picture of the sunset over Savusavu Harbor. Me:Do you have access to my previous chat history? Shubhankar:Hello, my name is Shubhankar. I'm here to help you today. Could you please tell me your issue. Shubhankar:Could you please provide me the link? I am sure you are a nice person but you can not help me. What I need from you is for you to contact someone who can help me. If yo give me 3 minutes to type I qill explain. Shubhankar:Roger, I have read your previous chat conversation and as I understand that you received an attachment and you want to open on your kindle device but you are getting an error. Let me walk you through it. If you don't understand stop me. Waiting for an OK from you. I am in Fiji so the Internet is slow. Shubhankar:As I have checked that you are taliking about a file that is in GPX format. Kindle device does not support GPX file. You can open this link in your PC. Pdf, Pdoc files is supported on kindle device. Me:Why? I don't ask you to support it. I ask to let me download it. Which you apparently choose not to let me do. This is not world class customer service. I can use the file on other devices after I download it. Why do you care what I do with it? Shubhankar:A member of our Kindle Specialist will need to help you with this. One moment for a transfer. Amazon:Hello, my name is Gowtham. I'll be happy to help you today. Me:Hi Amazon from Amazon.com. Does this mean you are a beautiful female warrior? Do you want to take a minute and review the chat history? Amazon:Yes, please give me a minute, so that I can check with your previous conversation. You are referring to access the gpx file using your Kindle device, right? Me:While you are doing that what you need to do is ask the Programming staff a simple yes no question. Do they block downloads based on file extention. If the answer is yes only a programming change can fix this for me. If no, there might be something else to do. I have already spent several hours trying to get the answer to that one simple question. I am not inclined to waste any more time until I get the answer. Yes, the gpx file extension is apparently blocked for no apparent reason. Amazon:You will be able to download all the attachments to your device. However your Kindle device support any of the file formats which have apps in default to access the docs of AZW, AZW3, TXT, PDF, MOBI, PRC, DOC, DOCX, HTML5 and CSS3. In this case an appstore Specialist is the best person to help you with this regarding the suitable app. Please wait while I transfer this chat. Me:I wish that were true but it is not my experience. I can download all the "supported" file extensions but none of the "unsupported" ones. SHAN HARRISON:Welcome to Amazon . I'm Shan Harrison, and I'll be glad to help you today. Me:I am using the Fire email app and it is blocking downloads of "unsupported" file types. Why do I need to get another app? It is a problem with the programming of you email client. You are now reconnected with SHAN HARRISON. SHAN HARRISON:Hello, my name is Shan Harrison. I'm sorry your previous chat disconnected. I will try and pick up where you left off. SHAN HARRISON:I would have to transfer your chat to the appropriate department that can resolve your issue. It'll just take a minute. Please stay connected. Chinmay:Hello, my name is Chinmay. I'll certainly try to help regarding your concern. Chinmay from Amazon.com has left the conversation. Chinmay from Amazon.com is no longer connectedSecure Connection.